SBU at Interbike | Self-Balancing Unicycle | Focus Designs, Inc.
Last week was a big week for us…we drove down to Vegas for the interbike expo, I was featured in the Columbian newspaper, Honda released their U3-X “unicycle” design and it appears that the SBU will actually be in the next MythBusters episode on October 7th. Things are moving along nicely here at Focus Designs. The Interbike show was amazing. Our booth was about 20 feet away from the demo area, which was pretty surreal with a constant flow of crazy new contraptions, bikes, scooters and SBUs of course. We always had two SBUs in the demo area ready for people to test out, and did they ever. We trained 100+ new SBU riders while at the show. 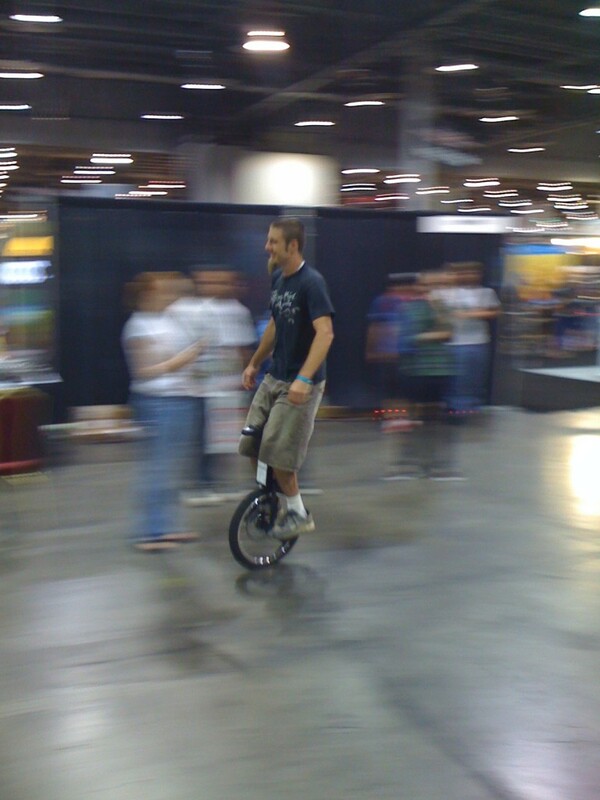 Being a bike expo, most people had good balance which meant that new riders were learning the SBU in about 10 minutes. It was definitely the hit of the demo area, said the demo area coordinator. We were the only exhibitor that had a line of riders waiting to ride. The SBU is something that you really have to test ride to understand and appreciate, and it was great to have a space for bike shop buyers/owners and the media to take it for a spin and really kick the tire. It was also a great testament to the durability of the SBU. People were pretty hard on the SBUs, crashing them into other bikes, dropping them and trying new tricks. We didn’t have a single issue with any of the SBUs. While in Vegas three of us took the SBUs out on the strip and got quite a bit of attention. People were stopping us asking where they could rent them and how they worked. It also demonstrated how well the SBUs work in large crowds, we felt confident riding between people knowing that we could stop on a dime by putting our feet down and wouldn’t run over their ankles because the SBU tire is safely between our legs. An SBU rider basically has the same footprint as a pedestrian. 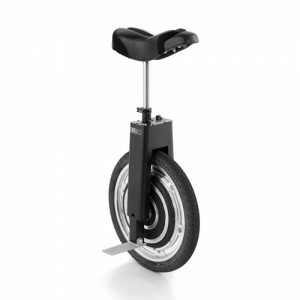 Also they were a breeze to carry up stairs or take on elevators and escalators. Overall the Interbike show was a great experience. We got our name out there and showed everyone that the SBU is a legitimate product that is fun, useful and durable. And the orders are already starting to come in. Thanks to David Martschinske and Alan Ecoff for helping make it happen; and everyone else with thier encouraging words and willingness to try the SBU. Fun to see so many cyclists getting to try the SBU at Interbike. 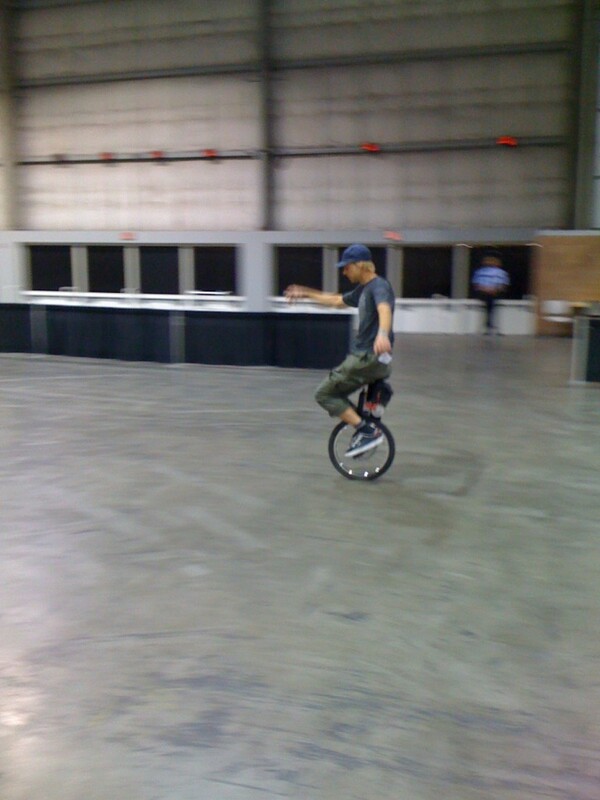 When we would tell people we sold unicycles, a lot of exhibitors immediately mentioned how amazed they were by the SBU.